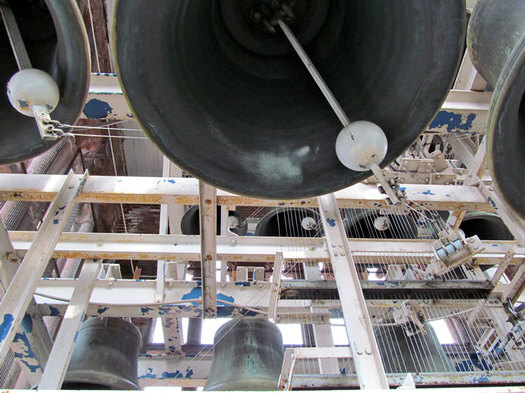 A few days ago, the carillon bells atop Albany's city hall played something a bit unusual. Instead of Mozart, The Beatles' "Michelle" rang out over the city. Charles Semowich smiled as he played from his Hits from the 60s book. He gets to pick the music he plays and usually tends to play the loudest songs he can find. 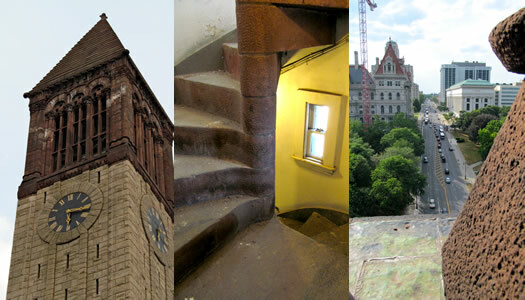 Because from this seat above city hall, the carillon players of Albany can be heard by every state worker, police officer, pedestrian, politician and park walker. And they like that power. So what is a carillon? It's a bell instrument played by striking a keyboard of batons with one's hands and feet. The keys connect to wires, which pull at large clappers, striking the carefully tuned immobile bells. It's like a more physically demanding piano that can only be played in a tower. 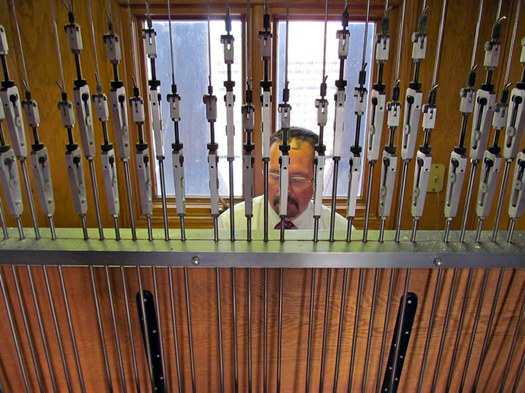 Semowich has loved the carillon ever since he first heard it in 1986, when Albany restored its original 1927 instrument. "I heard it and thought, 'Oh how great, it's so different.' I liked the idea of an instrument where people can't walk away from it." He had always been musical and played the piano, organ and hand bells for years, but was drawn to the difficulty and uniqueness of the carillon. So he traveled to the University of Michigan for a summer workshop in carillon playing. Albany's carillon was dedicated in 1927 through the donations of 25,000 people. 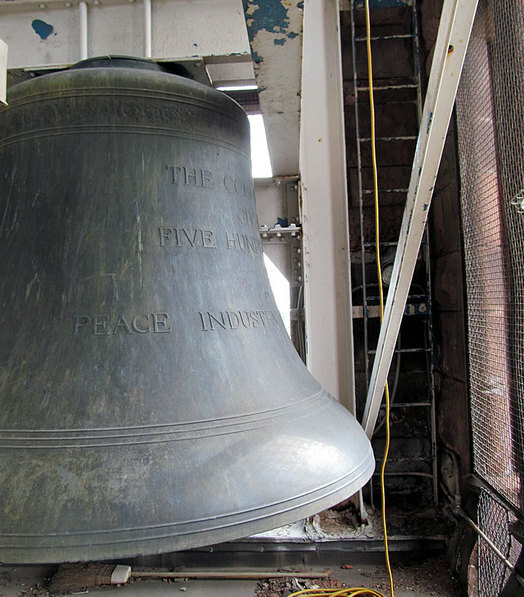 It has 49 bells ranging from small to gargantuan (Albany's largest bell has a 5'9" diameter and weighs 10,953 pounds and the smallest bell weighs in at only 27 pounds) There's only seven of them in all of New York State. It was restored in 1986, the bells recast and replaced and is now used to celebrate special occasions such as weddings, funerals, inaugurations, Tulip Festival and holidays. It is also played three times a week, but while the first concert in 1927 drew 50,000 people, these days the numbers have dwindled significantly. 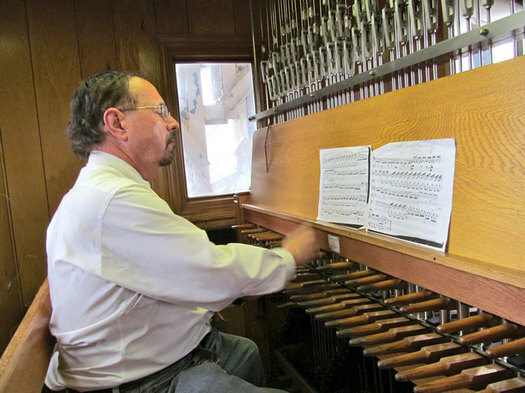 "I tell people that I play the carillon and they either don't know what it is or they think the bells just play by themselves... it's frustrating," says Amy Heebner, another Albany carillon player. Her path to the instrument is just another one of those cliche stories of an impressionable college freshman experimenting with a musical instrument because a lot of her friends were doing it, too. Charles and Amy now share the tower, entering in through a small door in the back of the Department of Development and Planning. 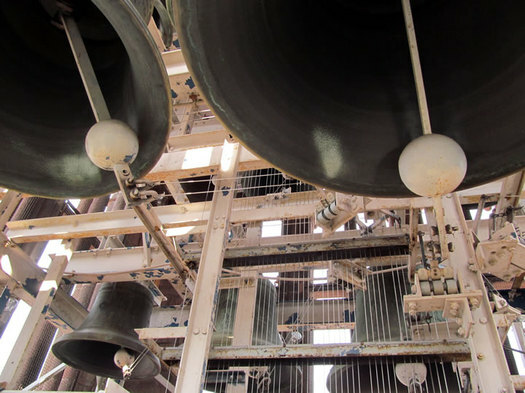 After climbing 101 steps up a winding staircase, you reach the carillon, 49 bells hanging over your head. But the keyboard is inside a nice air-conditioned room, only large enough for the instrument and the player. There, they play out over the city. "I like the idea that everyone has to listen to me," says Charles. Amy agrees: "I love playing an instrument that is fun, difficult and where everyone can hear you but no one can see you." Which makes sense when you see the carillonneurs strike the batons and bounce in their seat from their effort. And it's easy to understand what they mean by it being a fun instrument. But for both players, their love of the instrument boiled down to one thing: the sound itself. "The sound is just beautiful," says Amy. "It's like pizza. Why do I like pizza? Because it's pizza, it's delicious. Why do I like the carillon? Because it is beautiful, the music it makes is beautiful." Thanks! I really enjoyed this article and especially the photos! I work right up the street from City Hall and get to hear the carillon fairly regularly. They're lovely! Thanks to the carillon players! You bring music to our lives daily! Would love to see a video of someone playing the carillon! This is really awesome! I always assumed that all bell towers functioned similarly to a player piano or music box, running off some kind of script. Marcia - I had to see a video of one being played too - thankfully there are a bunch on YouTube. A handful of years ago, I worked for the Institute for Humanist Studies on Howard St., a block from City Hall. At noontime, the automatic church bells would turn on and play their automatic church tunes. And then, one day, in the midst of that cacophony, I could hear a tune that Charles Semowich was playing HIMSELF on the carillon: "It Ain't Necessarily So," from Porgy and Bess. My grandmother used to play it (she subbed for regular cailloneur, Floyd Walters, for decades. The winding steps are a treat.. very steep.. and it is an amazing instrument with tons of stops.. and takes a lot of physical strength to operate pedals. I always imagined those bells ran like a player piano too. I heard them playing the 'Winnie the Pooh' theme song one day; that made my day. I love the carillion, I like to hang with Lewis Swyer in Academy Park and listen on my lunch break. Sometimes I can recognize what's playing and other times I just guess. What is the schedule for the carillion? I've heard it at lunch time before, but at there specific times? Thank you for the great article and the kind remarks. I am hoping that Julia will be in touch with me. I am working on the history about this carillon and would love to know more about her grandmother. In reference to my research, my article about the 1927 dedication was recently published in the Dutch Settlers Society of Albany Yearbook. I am now beginning to work on the Floyd Walters years. Thank you again. Thanks for this article. Stirred wonderful memories for me as I used to work for the Chamber of Commerce at 90 State Street. While I was there I was a member of Albany Rotary and got to know fellow member Joey Emma. He played them for a bit. Told me he always played "Happy Birthday" because it was always someone's birthday and that would make them smile! Great article. Thanks!